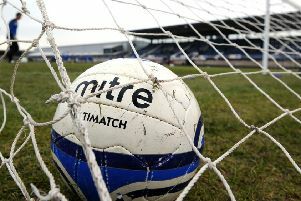 Ten-man Spartans conceded a penalty deep into stoppage time which denied them all three points against Cumbernauld Colts at Broadwood last night. The Capital outfit had taken an eighth-minute lead through David Greenhill’s accurate finish but then suffered a setback when former Edinburgh City midfielder Ian McFarland was shown a straight red card for a rash challenge just past the half hour. However, Dougie Samuel’s men rallied in monsoon-like conditions and were just seconds from a victory that would have moved them to the top of the Lowland League – for at least for 24 hours – until Adam Corbett was adjudged to have committed a foul inside the area. Stephen O’Neil duly accepted the invitation from 12 yards to rescue a point for the hosts, with the Ainslie Park side moving up to second behind leaders and reigning champions East Kilbride.